Lisa Petterson is a CPCFT (certified professional canine fitness trainer) through the Wizard of Paws Program. She is not qualified to work with dogs suffering from injury, or dogs in need of rehabilitation from injury. Join us in Kamloops, BC for a full 2 days of Fitness Training! Learn the benefits of fitness training for your dog! We will cover 10+ fitness exercises that require minimal equipment, that are suitable for ANY healthy dog! Puppies must be at least 10 months of age at the time of the seminar. ​See below for registration forms! Fitness classes will be run based on instructor availability and interest!! Fitness Foundations classes are included in Agility classes. Contact Lisa for more information on her online fitness courses and programs! New to October 2017, I have decided that FITNESS will be a mandatory addition to all Agility classes. It is a great sport to showcase your dog's athleticism. To demonstrate their speed. Their flexibility. Their ability to jump, climb, and navigate obstacles. But agility training is not a way to BUILD that athleticism. That work needs to be done OUTSIDE of agility training. Once you ask your dog to try agility, they become an athlete. And athletes need to be physically prepared for anything their sport throws at them! We ask our dogs to do crazy things in this sport. To jump high - sometimes higher than the dog themselves. To turn on a dime. To balance and run full speed across narrow, sometimes moving, boards. We ask them to run as fast as they can while twisting and changing direction. Is your dog prepared for these challenges? For a game that THEY never asked to try. It is only fair that we prepare them physically and mentally for what we are asking of them! I believe fitness and conditioning work should ALWAYS be included as part of the foundation training for your chosen sport. That is why I have chosen to add mandatory fitness classes for all of my agility students. This may seem excessive to some ... and I may lose students because of this decision. But I truly believe the dogs need it. Your dog needs to be physically capable of what you are asking them to do. And just doing the agility training isn't going to build up the dog's strength, endurance, and flexibility. Only separate, targeted fitness exercises can accomplish that. If you aren't prepared to step up for the well-being of your dog, that is fine - you just can't play agility with me. It truly is in the dog's best interest!! Trust me, your dog will thank you! 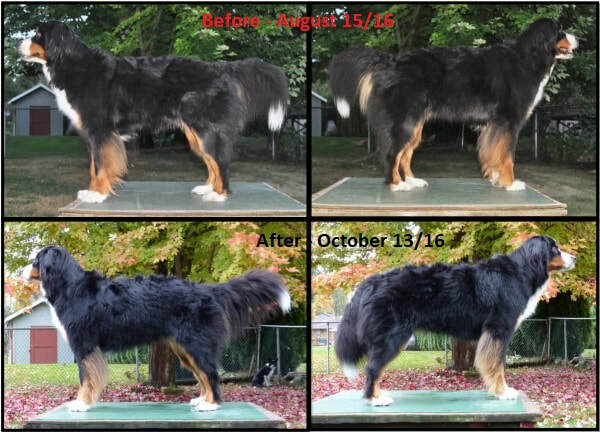 Before and After comparison of Nellie, 6 year old Bernese mountain dog. This was from an 8 week fitness foundation program. Can you see the differences?